I opened that file this week and came across a set of quotes from people in managerial positions communicating to their employees, or at least trying to communicate. Here a just a few of them. Thoughts like this kind make you scratch your head a little, don’t they? Sometimes I worry that the language of Christians is a little like that. Like the mangers that I just quoted. I think they knew what they were trying to say, but it didn’t come across very clearly when they said it. As Lutheran Christians we share something in common with many other, not all, but many other brothers and sisters in Christ. We share a yearly journey in worship and really every facet of our life in Christ that’s known as the Liturgical Year – or the Church Year. This church year doesn’t begin on January 1st. It begins four weeks before Christmas with the season of Advent and ends in late November with the celebration of Christ the King Day at the end of a season called Pentecost. This liturgical year is not focused on the seasons of a chronological calendar. Its focus is the story of the birth, life, death, and resurrection of a savior named Jesus. As Lutheran Christians, we live in the ebb and flow of the liturgical year as we seek to follow this Jesus. Needless to say, I love the seasons of the church. I find comfort and hope and challenge and growth as the seasons change. But I was a surprised again recently to discover that not everyone shares my passion or even understands or follows the seasons of the church year as part of their life in Christ. Of all the seasons, I think Lent is my favorite. One of the reasons why I like it is because it’s a season that hasn’t been high jacked by our consumer driven culture yet. I mean, there are no Lenten reindeer or jolly snowmen dancing around with ashes on their forehead. There are no colored food products like Easter eggs. Another reason why I like Lent is that it’s not a one day event, but a journey. Lent is not like a New Year’s resolution where we try to give something up or start doing something healthy in our lives. Lent is a never-ending journey that invites you and me into relationship with God each day and into relationship with our brothers and sisters in Christ. In this journey of Lent, we are reminded once again just how much God loves us and how we are called to share that love with our brothers and sisters in Christ. 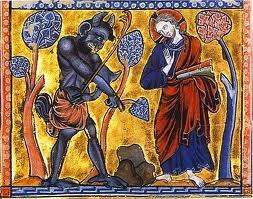 At about this time in my effort to explain Lent to my friend, I noticed that he was staring at me blankly. You know that stare. The one that screams out, “I have no idea what you are talking about.” I know for a fact that you know what that looks like. Actually, it’s very similar to the stare I’m receiving from many of you at this very moment. So let’s try this again. Like nearly every aspect of our life in Christ, we can’t just look at Lent on the surface and expect to understand what it is and why it is such an important part of our journey as followers of Christ. If we only do that, it will be hard to understand how in the world we are ever going to live up to the expectations that seasons like this place on us. Think about it in connection with our gospel reading today. This is the same “temptation” text that we hear every year on the first Sunday in Lent. Trying to connect our lives today with the temptation that Jesus experiences with wild beasts and wilderness and Satan lurking around while angels serve him is confusing for us; or at the very least a little intimidating. Wild Beasts. Wilderness. Satan. Angels. But Pastor Scott Black Johnston seems to think that these images in the desert, the wilderness as the gospel of Mark calls it, are helpful. I hope you can relate to what he says about Lent and the wildernesses that we encounter in our lives. So, Lent is not about giving up all of the things that tempt us each day for a prescribed period of time – in this case 40 days or so. Lent reminds us that as we struggle with temptations, regardless of where we are in life, God is with us. Through Lent, we remember that we are resurrection people even as we live in a world that often looks and feels and smells a lot more like the darkness of Jesus’ crucifixion and death on Good Friday. And as people of the resurrection we are invited to live in the hope and promise that God is always with us. In life and in death. In times of wilderness and in times of peace. Lent is a season of the liturgical year, the church’s year, when we remember that Jesus has already been to every wilderness we will ever face. Jesus knows when we are lost in the wilderness. And Jesus will always meet you and me in those wilderness times and carry the weight of those times with us and for us. This God will never let us walk alone. Brothers and sisters in Christ, I think that is what Lent is. And that’s why Lent is my favorite season. May God bless you and keep you along your Lenten journey. Amen. This entry was posted on Monday, February 27th, 2012 at 1:17 am	and posted in Recent Sermons. You can follow any responses to this entry through the RSS 2.0 feed.